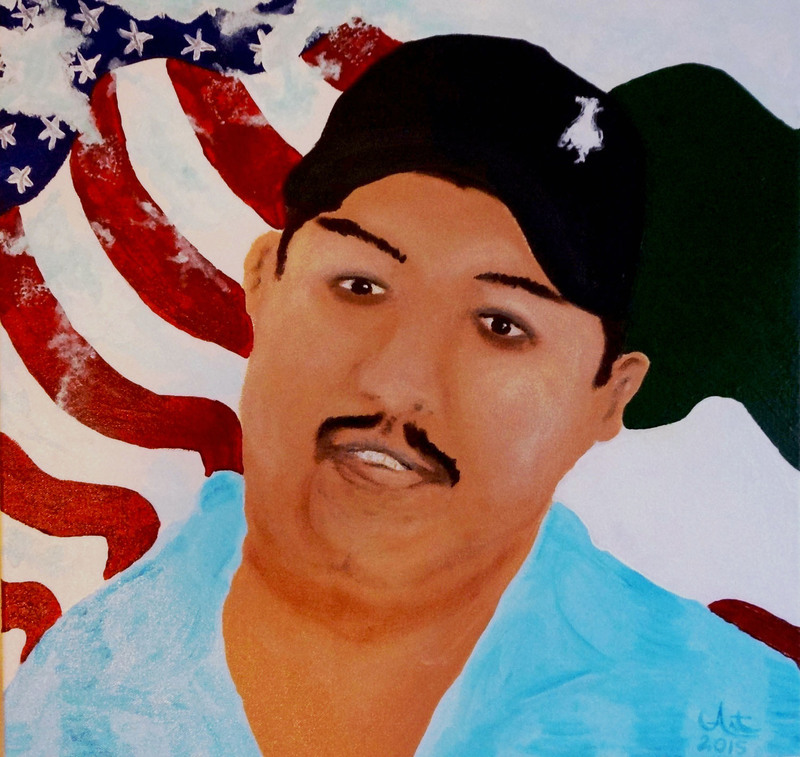 Garcia's American Dream, painting by Art Gomez, Charleston, South Carolina, 2015. Working class Latino immigrants often live in areas of the Lowcountry that are worlds away from the Charleston area’s exclusive neighborhoods, subdivisions, and resort communities. Their worklives are hidden from the public by kitchen walls, construction site fencing, and tall rows of crops. Cultivating obscurity is a way of life for many area Latino immigrants, and obscurity is often times a strategy for survival. It is a response to the racism and language barriers that together with their complicated legal statuses threaten their safety and limit their chances at success. The fear of deportation, fines, arrest, or other sanctions can make routine encounters with law enforcement officials, teachers, doctors and any kind of government employee a trigger for anxiety. Even immigrants who live and work legally in South Carolina learn to deflect attention from themselves. While it may be a necessary coping mechanism, obscurity also makes Latino immigrants vulnerable. Criminals have preyed upon Latino laborers knowing that they are often paid in cash and may be unlikely to report assaults. Problems at local schools go unaddressed by parents who are hesitant to meet with teachers. Similar fears prevent Latino immigrants from seeking medical care and other needed services. Anonymity also slows the development of group leadership and inhibits Latinos from asserting themselves as a political force. A small but growing number of Spanish-speaking frontline professionals such as teachers, doctors, lawyers, and social workers have served as able advocates for individual immigrants, but local lawmakers have been slow to respond to the needs of the overwhelmingly working-class Latino majority. Some South Carolinians, long resistant to social change, have made Latinos the focus of their anxieties and dissatisfactions. They have been vocally unwelcoming. The following interviews explore how these vulnerabilities impact the quality of life of Latino immigrants. Latino construction workers working on a building during the Martin Luther King Jr. Parade, photograph by Kerry Taylor, Charleston, South Carolina, January 16, 2017.